The Innovative Portfolio For The Artist On The Go! 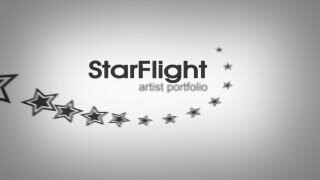 The StarFlight is the very first artist portfolio that allows you to get inside the case by just opening up the flap that is attached with Velcro. There are no straps, loops, latches, zippers and other devices to work through. In fact you can get into your portfolio without even taking it off your shoulder! Artists basically asked their portfolio to be more like a caravan than a highly styled and sporty case. To accommodate this need a 5" expanding gusset was decided on. To make the case functional the artist can organize their "studio in a case" in 3 separate compartments. You'll be amazed at just how much you can get into your Starflight. So if you want a maximum amount of inner space that is easy to get to in one easy motion the Starflight is the invention built just for you. Each case with 5" gusset. Starflight Accordian Style Portfolios is rated 5.0 out of 5 by 3. Rated 5 out of 5 by Enso from Accordion portfolio I bought this to have a place for the pictures I have mounted and need a safe place to store. This portfolio holds 13-15 pictures. I do sumi-e painting and wet mount rice paper on foam board. Attached is one of my pictures. Rated 5 out of 5 by still bella from Excellent portfolio! This wonderful portfolio, which nicely transports paintings in separate compartments, doubles as an art briefcase for supplies when painting away from the studio. Beautifully made and protective of contents, comfortable to carry by hand, shoulder strap or cross-body. Rated 5 out of 5 by sid1776 from very nice potfolio Nice construction, fairly light weight yet sturdy. Given as a gift but the recipiant was thrilled and anticipates much utility from this portfolio.